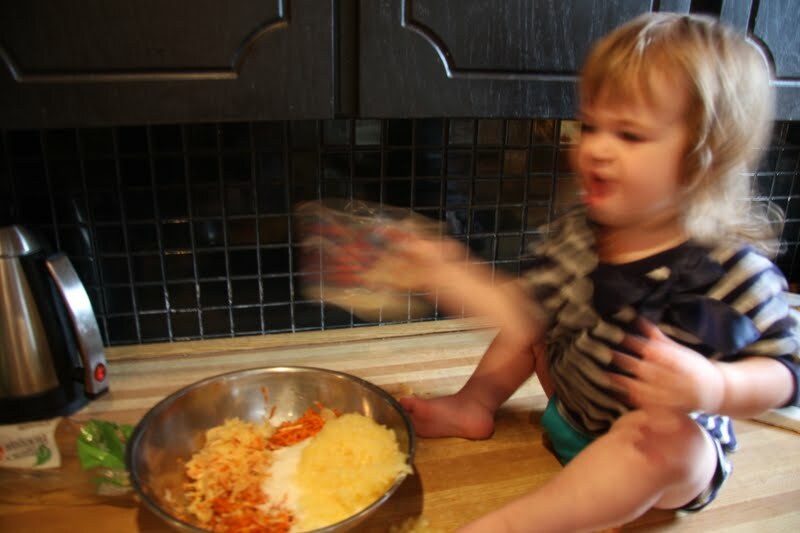 I’m not sure how hygenic this baking segment seems but I wanted to show the reality of cooking in my house. I have a little helper. If I don’t put her up on the counter then she moves a stool over and precariously, teeters on it. 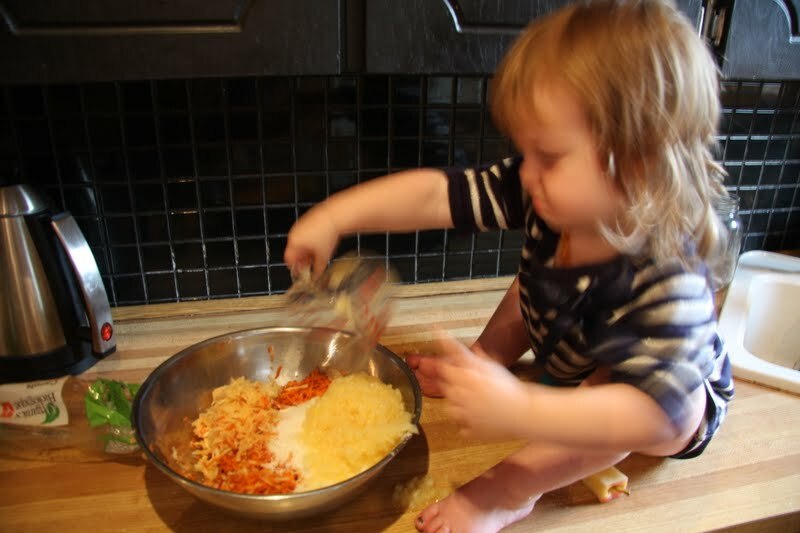 I used to try to engineer another activity to entertain her while I cooked but then I started to think “Maybe this can be ‘our thing’, maybe this is our activity and maybe I need to let go of some of the control and maybe things won’t turn out”. So here is reality when making Morning glory muffins. 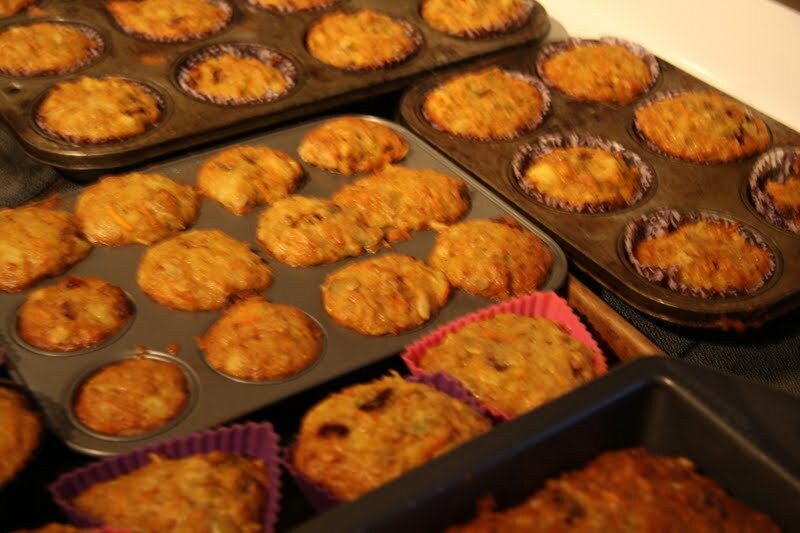 There are a tonne of different recipes out there for this type of muffins. This happens to be my favourite and it makes A LOT (see end of post) but it can easily be halved. I first started using the recipe when I was catering breakfasts for “Perfect Pear” in London. The nuts and dried fruit can be anything you have in the house. I’m using dried cranberries and pepitos today (pumpkin seeds) because I’ve got them and I’m taking some of these muffins to places where nuts are not allowed. 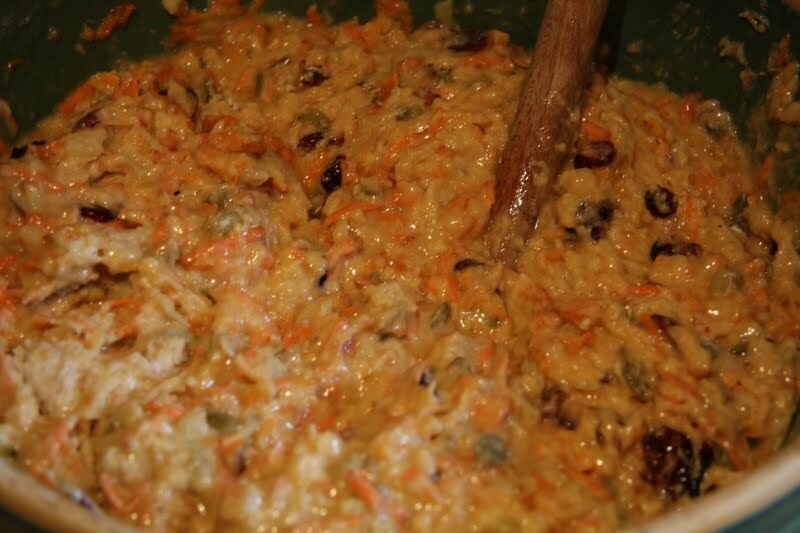 In my bowl I’ve got; 4 cups grated carrots,2 grated apples (I leave the skins on), 5 eggs, 1 1/2 cup sugar, 2 cups crushed pineapple, 2 cups shredded coconut, 1 1/2 cups dried fruit, 1 1/2 cups nuts. Sometimes in reality the ingredients get taken out of the bowl and returned a few times just because it’s fun. Making muffins is apparently VERY exciting. It’s made even better if you wave the measuring cups around and yell. Mix, make sure you do this just before bathtime for both of you. This stuff sticks like glue. BAKE! 330 until a knife comes clean (about 15 minutes). Muffins for everybody! These also freeze very well. Once again I’ve been inspired by the “Mrs.” and I’m going to get our downstairs pantry under control. It looks like I have a mini grocery store down there right now so buying more goods (other than freshies) doesn’t seem to make much sense. 1) Around 15 different containers of dried beans. I think we’ll have a few of these but come on…and they don’t go off. 2) Approx. 30 packages of jello. These are all from my father-in-law’s house and I don’t actually like jello enough to have 30 servings of it. Apparently there is more waiting to come. Want some jello? Maybe this can be my first give away on my blog:) I did find a recipe for homemade marshmallows in the Kraft magazine and that might be the ticket! Below also find a great recipe for trifle. 4) 3 cans of coconut water? 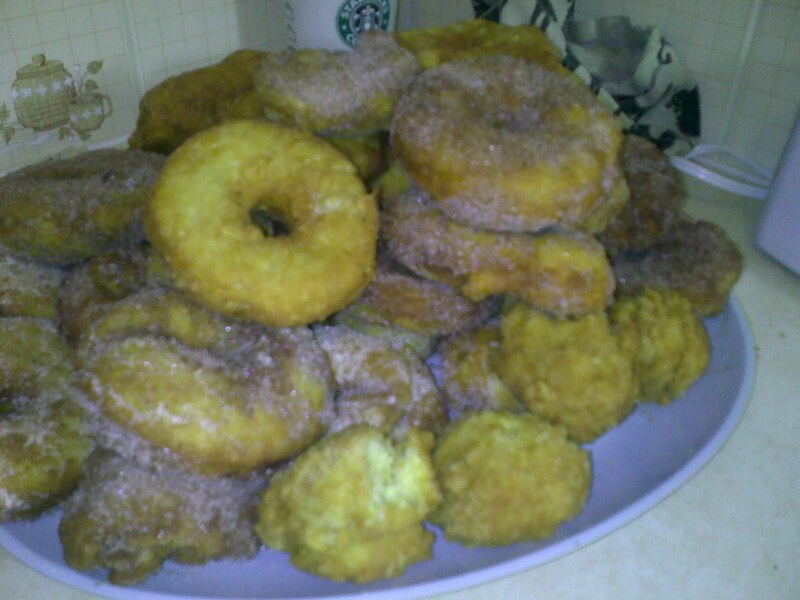 Homemade Donuts (recipe previously given). We were lucky enough to be invited to great friends for dinner the other night and I offered to make dessert. What to make for a crowd of 15 with a whole bunch of little ones? Donuts. Who doesn’t like fried dough? One day I will even have enough bacon fat saved-up to fry them old school in that tasty goodness. This time I just used canola oil. This seemed to be the weekend to catch up with people as last night we were able to hangout with some of my work peeps. I wanted something that would feed a crowd but still allow me to actually talk to my guests and not have a tonne of clean-up. 1) Appetizers; homemade pickles, homemade bread, crackers, goat cheese with rhubarb chutney and chorizo heated in the oven and served with honey mustard. 2) Main: Arugula and blood orange salad, more homemade bread and a big pot of beef bourgignon. This is dead easy. In a heavy pot (if you have a big Le Creuset this is perfect) simply brown five pieces of bacon that have been cut into 1/2 inch pieces. Take bacon out-leave fat. Add 2 lbs. of beef that has been cut into chunks and then dregged in a bit of flour (salt and pepper the flour). When brown add; the reserved bacon, 3 cups of beef stock, 3 cups of button mushrooms, 1 cup of red wine, 1 tsp of dried thyme (or fresh if you have it), baby onions that have been peeled (2 cups), 1 tsp. juniper berries (don’t worry if you don’t have them) and 2 bay leaves. Let bubble away for a minimum of 3 hours. 3) Dessert: I snuck in some of challenge items to make the dessert and whipped together a trifle. 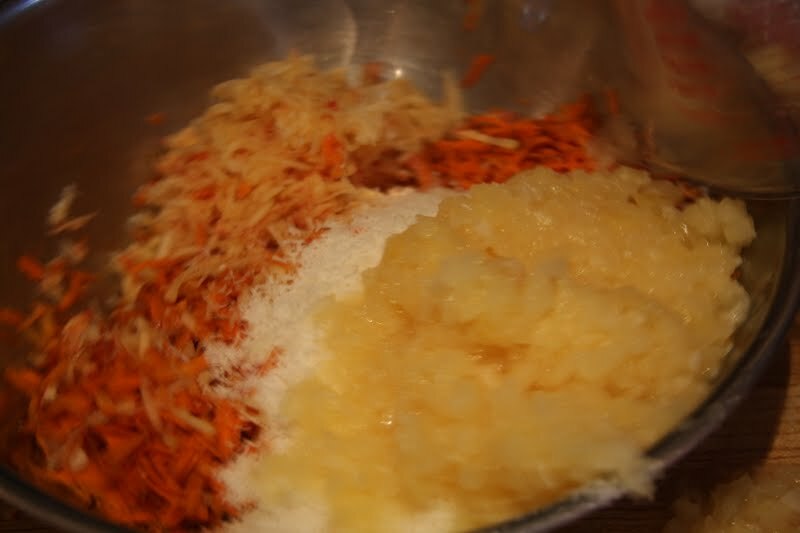 This is a weird recipe that I am not sure where I got it but people (ie my husband) will eat it until they are ill.
Have a white cake baked OR get a grocery store pound cake. Cut-up and douse in a bit of sherry. Layer into a bowl and up the sides. Take 2 cups of frozen raspberries and mush them (highly technical cooking term alert!). 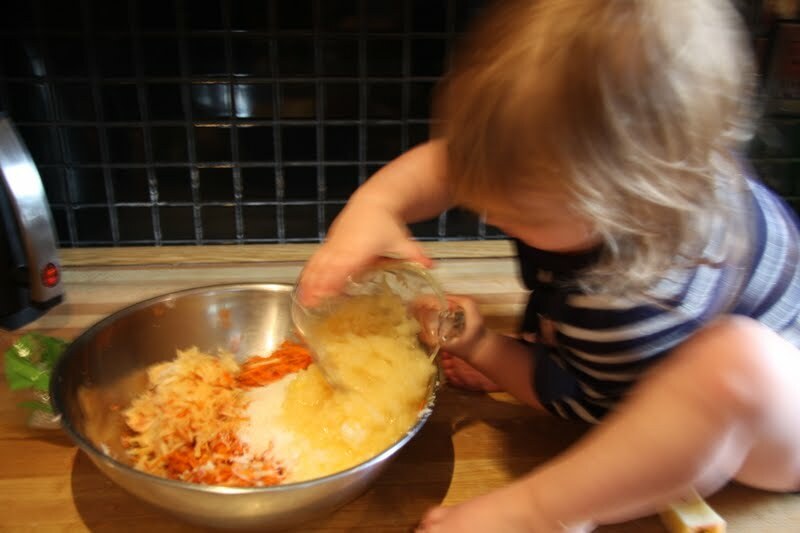 Add to the cake in the bowl. In another bowl prepare a package of raspberry jello with 1 cup of hot water and 1/2 cup of cold water. Top the raspberries. In a pot, heat 2 cups of milk, add 2 T. of custard powder and 1 T. of sugar (these mix best if you take a bit of the milk out, mix with the custard powder and then add to the rest of the milk). Top the raspberry and jello with custard and add another layer of cake. Chill for a minimum of 1 hour. 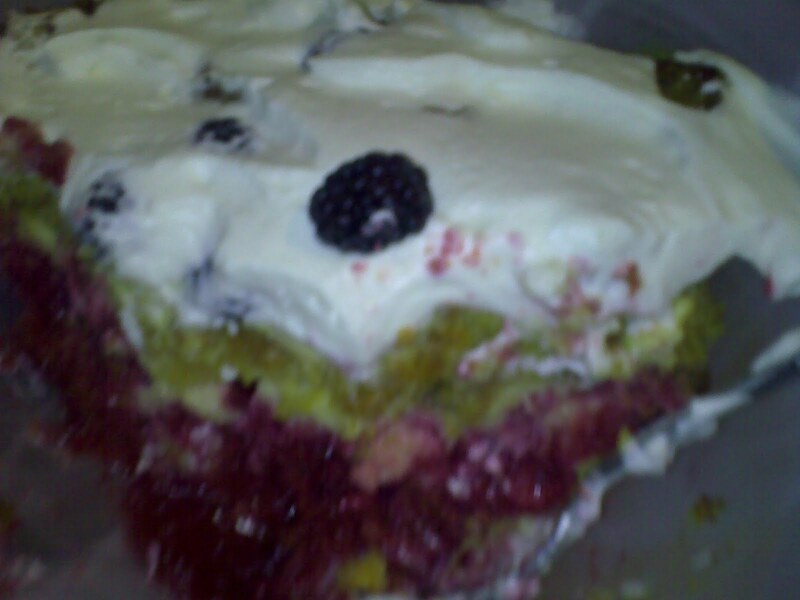 Top with berries or chocolate shavings or toasted nuts and whipped cream. This recipe sounds like a disaster but it is fabulous. Tonight, we’ll be having a big salad and tuna bouchon. I found this recipe while reading Molly’s book (see previous post about inappropriate usage of people’s names after reading their blogs) and it made me want to use canned tuna (bleh-sorry, we always had cats and they ate canned food and that is what is in my head when I open a can of tuna) oh-and visit France again, like right now. How is it that the dreaded canned tuna takes on a more favourable tone when given the French moniker “Bouchon au Thon”? These bouchons—a crustless tuna quiche of sorts, I suppose—are delicious warm or at room temperature, with a green salad and a good baguette. In a medium bowl, break up the tuna with a fork, smashing it to a rough paste. Add the tomato paste, crème fraîche, eggs, gruyère, a good pinch of salt, Italian parsley, and onion, and mix well. The batter should be relatively smooth. Serves 4 as a light meal with side dishes. Lastly, tonight will be the night to make the weekly muffins. I didn’t quite get to those yesterday so tonight I’ll do up one of my favourites and even use a can of pineapple from the pantry 🙂 I’m excited about this recipe because my former Morning Glory recipe had an obscene amount of oil in it (tasty but more cake than healthy muffin). I’ll post some of my other ideas later this week as I come-up with them.